Pixar’s best films reach beyond the balance of the peerless animation, the ageless wit in their humor, and their tear-jerking narratives. These elements (for which Pixar has demonstrated mastery time and again) would make any film a triumph, but Pixar’s ability to add another layer of subtext or social commentary to their work continues to impress. Consider Finding Dory, the follow-up to 2003’s landmark Finding Nemo. In the sequel, a Californian rehabilitation aquarium called the Marine Life Institute (MLI) serves as a major location. The MLI’s motto promises “rescue, rehabilitation, and release” for injured sea animals, and its presence is an indirect slight to theme parks like SeaWorld—places more jealously concerned with selling tickets to their latest performance by captive mammals than any thought of reintegrating their stock into Nature. Finding Dory uses the MLI not as a soapbox to deliver a moralizing or preachy lesson; rather, it’s a central setpiece that also performs a subtextual function. Ideally, viewers will walk away from this sequel with the unconscious (or even better, conscious) feeling that healthy marine life belongs in the sea, not in captivity. In addition to Pixar’s usual flawless animation, deft humor, and tender emotions, this undercurrent in Finding Dory demonstrates the animation studio’s love of the material. Indeed, to learn about marine life in preparation for Finding Nemo, Pixar artists and animators spent hours in the presence of real-life aquariums like Finding Dory’s MLI. In addition to the Pixar staff’s scuba diving research trips, spending so much time around marine life undoubtedly left them with an appreciation for seeing these creatures in the wild. 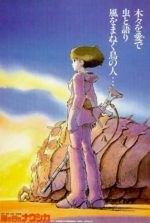 Being together with one’s family in the freedom of the sea is the central theme driving the sequel’s heartening story, but it also contains a clever message. For that, we must be thankful. 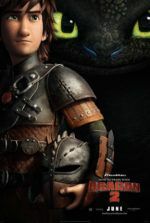 Of course, there’s more to savor in this or any Pixar film than their occasionally lofty undertones, even though the screenplay by Andrew Stanton and Victoria Crowse deserves high praise for its narrative breadth. Co-directors Stanton and Angus MacLane have made an inspired sequel filled with genuine moments of drama, playful physical comedy, gorgeous visuals, and only a few moments displaying symptoms of “sequelitis”. After all, by title alone, similarities between the original and this sequel are bound to be made. And since Finding Nemo is ranked among the very best of Pixar’s output, such comparisons may be unfair. How could the studio catch lightning in a bottle twice, especially given that Finding Dory is yet another story about a fish searching for its family, only to discover it has a new family—the friends that were helping throughout the journey? Point of fact, Pixar’s undersea spectacle spends an unlikely amount of its runtime above the water’s surface at the MLI. But before we get there, the film opens on Dory, the forgetful blue tang, as a young swimmer, and her parents Charlie (Eugene Levy) and Jenny (Diane Keaton) trying to teach her memory tricks. Should she ever get lost, Dory’s parents instruct her to say, “I suffer from short-term memory loss”—a saddening line delivered with appropriate aww-dorable-ness by young voice actor Sloane Murray. Whereas Dory’s inability to remember things beyond a few seconds largely served a device for humor and the plot’s forward-motion in Finding Nemo, the sequel deepens her malady into a disability she must overcome. Cut to a year after the events in Finding Nemo, where Dory (Ellen DeGeneres) now lives in the same reef as nervy clownfish Marlin (Albert Brooks) and his son Nemo (Hayden Rolence). After experiencing a memory flash, Dory remembers her parents and vague details about how she was separated from them as a child, shown in brief, ridiculously cute, and sometimes aching flashbacks. Marlin begrudgingly accompanies Nemo on Dory’s quest, which leads her to the MLI, a place Dory has been before. She’s reconnected with old friends, such as the near-sighted whale shark Destiny (Kaitlin Olson), but she also befriends a new ally, a cranky octopus named Hank (Ed O’Neil, just great), who’s desperate to escape. Octopuses are famous escape artists; no aquarium can contain them. Watching Hank in action remains ever fascinating and entertaining, as he leaps like Tarzan on pipes and walls, or scurries along the floor like a ninja. 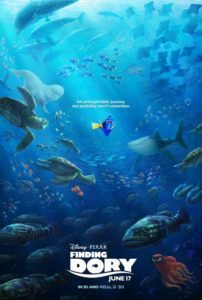 At the same time, Marlin and Nemo are separated from Dory and must take another route, specifically one involving two seals (voiced by Idris Elba and Dominic West) and a deranged loon named Becky, to reconnect with their friend. Hank affords Finding Dory a chance to escape the water and explore the MLI, as he transports her around in a glass of water from tank to tank. His cephalopod camouflage blends with all manner of textures in chameleon-like fashion, allowing the character to disappear onscreen in a wonderful effect (he first appears over a “Hang in there” kitten poster). Later, Pixar once again demonstrates the monstrous insensitivity of children when Dory and Hank find themselves in the park’s “Kids Zone”—where youngers can reach in the water and touch, nay, squeeze small marine animals—and from the animal’s perspective, it’s a nightmare not unlike Pixar’s other horrific human children: Sid in Toy Story or Darla in Finding Nemo. Elsewhere, our heroes narrowly escape the chomping beak of a bioluminescent squid, brave the open-air dangers of a theme-park, and later must escape a truck headed to the worst fate of all… Cleveland. It all looks almost distractingly beautiful, with certain scenes taking on a photo-real quality to the water or lighting. One of the best gags in Finding Dory revolves around Sigourney Weaver, who voices herself in prerecorded loudspeaker announcements at the MLI. Granted, most children in the audience won’t understand the hilarity in Dory proclaiming, “We have to listen to Sigourney!” But the humor isn’t lost on adults. Meanwhile, the majority of the film’s emotion resides in Dory’s ever more informative memory flashes back to her childhood, when her parents struggled to imprint ideas onto their child’s brain. Present-day scenes move at a faster pace, breathlessly leaping from one perilous survival situation to the next. And though plenty of touching moments occur throughout, the story never leaves us in a sloppy, teary mess the way some Pixar films tend to do. The tone here feels lighter, maybe even sweeter, but a touch less substantial dramatically. This does not suggest Finding Dory is somehow lacking; originality is the only unabundant component—but it’s a sequel, and a certain absence of originality goes with the territory. Nevertheless, the film leaves us laughing and forms a lump in our throat more than once. 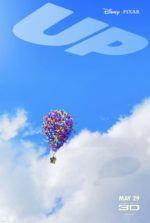 The overarching theme in both Pixar’s masterful original and the sequel suggests friends and family are two sides of the same coin, that our weaknesses can bring people together, and eventually our shortcomings can be turned into strengths. Amid these universalities, Finding Dory shows a greater respect and awareness for marine life than its predecessor in its willingness to show undersea garbage, or a fish’s displeasure with captivity. If even a few children walk away from this sequel and resolve to devote their lives to helping stop, or even improve conditions for, marine life in captivity and in the wild, then the film means something profound. Even if that’s not the case, Finding Dory will stand as a solid, charming, and ceaselessly pleasant Pixar sequel.